Austin Hill will return to NASCAR Camping World Truck Series competition this weekend, driving the Empire Racing Group’s No. 82 ­­­Ford F-150 in the Fred’s 250 at Talladega Superspeedway. 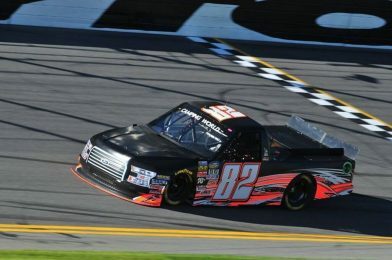 Hill, a NASCAR Next driver and K&N Pro Series East winner, is partnering with the Empire Racing Group to compete in three upcoming NCWTS races including: Talladega Superspeedway, Martinsville (Va.) Speedway and Phoenix Int’l Raceway. The 22-year-old Winston, Ga., native has four NCWTS starts under his belt. Two of those starts came earlier this year when he competed at Daytona and Dover. While a left rear tire went down and ended the team’s day early at Daytona, but Hill remains optimistic about his upcoming return to a superspeedway. Empire Racing Group crew chief, Mike “Grumpy” Cheek, is looking forward to working with the up-and-coming NASCAR driver this weekend. Coming into Talladega with a little more knowledge on how to draft, Hill is already starting to think about which drivers and teams he could work with throughout the race despite not being at the track every weekend.